﻿ Apple Cider Vinegar For Weight Loss Yes, It's True! For many years, apple cider vinegar has been of great importance, chiefly as a health tonic. For instance; its capacity to lower the level of blood sugar in the body is a well-known benefit confirmed by research. One question which pops up recurrently in the minds of many. 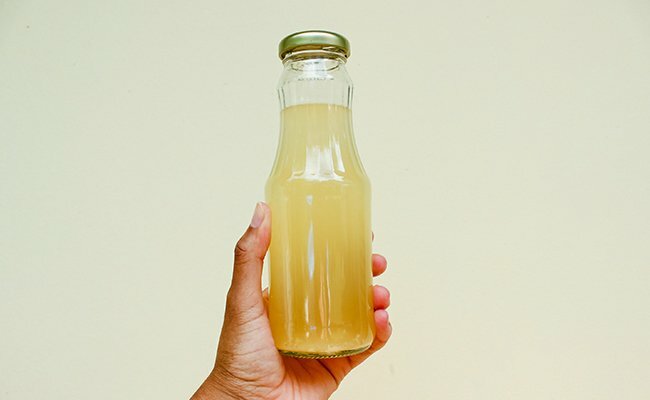 Will adding apple cider vinegar to my diet have any effect against weight loss? Such question and more is what this article seeks to give precise answers to regarding apple cider vinegar for weight loss. Also, it also proffers useful hints on how to add apple cider vinegar to your diet. Apple Cider Vinegar, its preparation? Step 1: Crush and combine apples with yeast to convert its sugar content into alcohol. Step 2: Introduce bacteria for the conversion of the alcohol into acetic through fermentation. The main component of apple cider vinegar is acetic acid. Otherwise called “ethanoic acid,” It is an organic compound with a sour taste but an overpowering smell. The name acetic is derived from acetum which is the Latin word for vinegar. Apple cider vinegar is made up of approximately 5-6% of acetic acid (2). Other acids like malic acid are found in trace quantity together with water. A tablespoon of apple cider vinegar which is about 15 ml is made up of approximately three calories without any carbohydrate content. Traditionally, the apple cider vinegar production usually takes about a month. However, in contemporary times, the availability of sophisticated equipment speeds up fermentation and reduces the process duration to a day. Improves Metabolism: A survey carried out on rats exposed to acetic acid revealed an increase in the production of the enzyme AMPK which is responsible or boosting the burning of fat and decreasing sugar and fat production in the liver (4). Decreases in the Level of Blood Sugar: A similar study revealed that acetic acid has the ability to increased the amount of sugar picked up from the blood by the muscles and liver (3). Fat Burning: In a related study, the acetic acid was introduced as a supplement in a high-fat diet and served to mice. The result showed an increase in the production of genes responsible for burning fat (5, 6, 7). Lowers Insulin Level: Another study still on rat showed a reduction in the level of insulin compared to glucagon. Consequently, it might improve the burning of fat (3). Suppresses Appetite: Another study showed that exposure to acetate is capable of inhibiting the part of the brain which controls appetite. This will invariably lead to low food intake. Apparently, there is a need for more research on the subject, especially on human, to confirm the experimentation on animals (8). Enhances Satiety which Reduces More Calorie Intake: Apple cider vinegar is known to increase satiety which helps in the reduction of calorie intake (9, 10). In a study carried out on 11 individuals; it was observed that individuals who took vinegar and a meal with high carb content recorded about 55% lower level of blood sugar an hour after they have eaten. These individuals were also reported to consume about 200-275 lesser calorie throughout the day (10, 11). Slow down the rate at which food leaves the body: In addition to its appetite-suppressing effects, apple cider vinegar has also been shown to slow the rate at which food exit your stomach. Delayed stomach emptying, a process called gastroparesis is a common symptom of type 1 diabetes. So, taking apple cider vinegar with such complication can worsen the effect of gastroparesis (12). It May Help You Lose Weight and Body Fat: Apple cider vinegar has a significant effect on body fat and weight loss (13). In a study which lasted for 12 weeks, 144 adult Japanese who were obese took either a placebo drink, 30 ml (2 tablespoons) or 15 m (1 tablespoon) of vinegar daily. They were also advised to stop their intake of alcohol while maintaining their usual diet and other activities through the period of the study. Results showed that those who took 15 ml (a tablespoon) of vinegar daily experienced the following benefits: 26% decrease in the level of triglycerides, 0.5inches (1.4 cm) reduction in their waist circumference, 0.7% reduction in body fat percentage, and 1.2 kg (2.6 pounds) of weight loss. The cohort who took 30 mL (2 tablespoons) of vinegar daily witnessed the following results; 26% reduction in the level of triglycerides, 0.9% reduction in body fat percentage, 1.9 cm (0.75in) reduction in their waist circumference, 1.7 kg (3.7 pounds) of weight loss. Those in the placebo group had a slight increase in the waist circumference with 0.4 kg (0.9 lbs) gain in weight. The result of this study showed that you could lose weight when you add about 1-2 tablespoons of apple cider vinegar to your daily meals. Similarly, it can as well help you to lose belly fat, reduce the level of triglycerides in your blood and reduce the percentage of your body fat. Additional studies are still recommended for a larger sample size although the results obtained here are encouraging. Decreasing Blood Cholesterol Level: Studies carried out on normal and diabetic mice, and rats showed that apple cider vinegar gave an increase in ‘good’ HDL cholesterol. It was also found to reduce triglycerides and ‘bad’ LDL cholesterol (22, 23, 24). Lowers Blood Pressure: Studies on animal suggest that apple cider vinegar is capable of decreasing blood pressure through the inhibition of the enzyme which is responsible for the tightening of blood vessels (25, 26). Enhancement of Insulin Sensitivity: Another study on individuals with type 2 diabetes or insulin resistance showed that the addition of apple cider vinegar to a meal with high carb content could enhance their insulin sensitivity to about 34% (19). Destruction of Bacteria and Viruses: Vinegar is known to destroy food poisoning bacteria such as E. coli. In a study, bacteria and viruses destruction by vinegar were 90% and 95% respectively (27, 28). Lowers Insulin and Fasting Blood Sugar: A study on individuals with type 2 diabetes showed that those who added apple cider vinegar to their evening snack which is of high protein content experienced a reduction in their fasting blood sugar twice compared to those who didn’t 14, 15, 16, 17, 18, 20). Improvement of PCOS Symptoms: In a small study carried out among women having polycystic ovary syndrome (PCOS). Vinegar was administered to them for about 90-110 days, and it was observed that approximately 57% of them had their ovulation restored. This is possibly due to an improvement in their insulin sensitivity (21). Apple cider vinegar can be added to your diet in some ways. Use it with olive oil as dressing for salad. When used in this way, it is delicious especially with tomatoes, cucumber, and leafy greens. It can only be mixed with water and drunk or with pickling vegetables. When combined with water, the amount of vinegar that can be used for weight loss on a daily basis is 15-30 ml (1-2 tablespoons). You can spread to about three doses daily, and it is best to be drunk before eating. Taking excess, more than one tablespoon at a time may induce nausea. Vinegar is very harmful at a higher quantity. So, it is best to take a moderate amount. Commence with 15 ml (a teaspoon) so that you can monitor your tolerance level. Undiluted vinegar can burn the oesophagus and mouth. So it best took when diluted with water. Vinegar when utilized in tablets, conveys enormous risk although is may seem beneficial. For instance, a woman’s throat was confirmed burnt when a tablet of apple cider vinegar got lodged in her throat (29). Vinegar should be utilized according to prescribed dosage for an excellent result (weight loss) and other health benefits. Different types of apple cider vinegar exist which may offer the same benefit, but those having a lesser amount of acetic acid are likely to have a lesser potency effect. The Amazing Health Benefits of Chia Seeds – Add This Superfood To Your Diet ASAP!